We’re all clamouring to get into space these days, but lost in our excitement to fly to the Moon and colonise Mars is a brutal truth: the final frontier is a cold, inhospitable wasteland that’ll kill you at the first opportunity it gets. Astronauts already know this, but for the rest of us, here are just a few of the potentially lethal dangers faced by spacefaring pioneers. Let’s handle the most obvious danger first — exposure to vacuum. This is, as I’m sure would-be explorers are taught on the first day of astronaut school, something that would best be avoided. Exposure to the extreme low pressure environment of space would cause an immediate vaporisation of fluids in the skin and uppermost layers of soft tissue. This would cause bubbles to form in the blood, and some seriously nasty swelling, though counter pressure exerted by your skin and circulatory system would keep the expansion in check, preventing you from “exploding,” as science fiction loves to depict death-by-vacuum exposure. Based on animal studies and the little data we have on human exposure to a vacuum, you would likely maintain some level of consciousness for the first 9 to 11 seconds before passing out due to a complete lack of oxygen. According to NASA, your mouth and nose would rapidly cool to freezing temperatures, and the liquid on your tongue, and soon after in the lining of your lungs, would boil. NASA, being NASA, foresaw this issue, and solved the problem by developing spacesuits, which today are whimsically referred to as EMUs (Extravehicular Mobility Units). “EMUs are essentially a self-contained spacecraft with many layers of material to protect the astronauts from the vacuum of space, micrometeorite impacts, and extreme temperatures,” Bryan Dansberry of NASA’s Johnson Space Center told Gizmodo. The next generation of spacesuits will be lighter, more manoeuvrable, and generally higher tech. Future EMUs (great band name if anyone is looking) will also have to combat an entirely new environment, and new dangers. If you’re planning on visiting space before these sleeker EMUs hit the market, a warning—in the event of a spacesuit breach, there are currently no means of sealing a tear or puncture. An astronaut would simply have to hightail it back to the airlock before the suit fully depressurised. An important lesson — sometimes, your life-protecting EMU may attempt, albeit inadvertently, to kill you. On July 16, 2013, as Italian astronaut Luca Parmitano was working on the outside of the ISS, his EMU’s cooling system failed, and proceeded to slowly flood his helmet. According to a detailed blog post penned by Luca in 2013, he was at first unaware of the severity of the situation. He considered that the wet sensation at the back of his helmet might be water from his drinking straw, or even a build-up of sweat from the effort needed to manipulate the heavy spacesuit. But the liquid was too cold to be sweat, and Luca could see no water escaping from his straw. The order was given to terminate the spacewalk, and return immediately to the airlock. As Luca retraced his path, the volume of liquid increased, covering his visor and headphones. 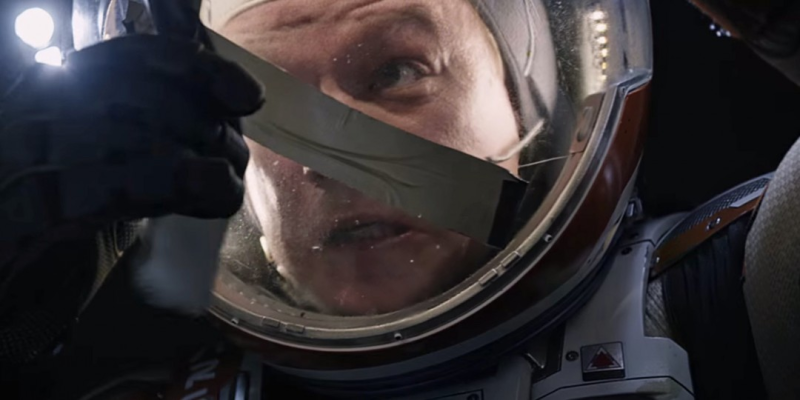 To make matters worse, in order to navigate around an antenna blocking his path back to the airlock, Luca was forced to shift orientation, causing the liquid to cover his nose, making it harder to breath. With the setting of the Sun, he was left blind, disorientated and unsure of his path to the airlock. In his darkest moment, the astronaut considered venting the water into space by releasing a safety valve located on his helmet. Thankfully, the story had a happy ending, and the valve remained untouched. Luca was able to follow his safety cable back to the hatch, where he waited for fellow astronaut Chris Cassidy to join him before beginning repressurisation. Considering the fact that the ISS has been flying continuously since 1998, the space lab is in a remarkably good condition. However, the health of the station, and that of its human crew, is under an ever-increasing threat from orbital debris. The ISS is protected by hundreds of micrometeoroid and orbital debris (MMOD) defences, making it the most heavily shielded spacecraft ever to orbit Earth. While this is enough to guard against impacts from tiny dust particles, the shielding would be unable to protect the station and its crew from a collision with a large piece of space trash. The critical systems of the space station—its habitable compartments and pressure tanks — are its best protected parts, but they could still be heavily damaged by a piece of space debris over a centimetre in diameter. According to estimates generated via statistical modelling, there are roughly 29,000 pieces of space debris larger than 10 cm in diameter in orbit, and roughly 750,000 pieces with a diameter between 1 and 10 cm. Some of these pieces of trash are known to circle the planet at over 17,500 miles per hour. At such a velocity, even a small piece of debris would pack an enormous punch. Despite the proliferation of debris in low-Earth orbit (LEO), a worst case Sandra Bullock Gravity-esque scenario is highly unlikely to unfold. This is thanks to the sophisticated early warning system that watches over the ISS. Large pieces of space trash are regularly tracked by the U.S. Space Surveillance Network. If the likelihood of a dangerous piece of debris passing within 1 km of the station exceeds 1 in 1000, the ISS is ordered to temporarily boost to a higher orbit, relying on the thrusters of a docked Soyuz spacecraft. This happens on average once per year. To date, there has been no significant damage to the ISS via a collision with debris, but to prepare for such a scenario the crew run regular depressurisation drills. During these practice scenarios, the crew attempts to identify and seal a simulated leak. If a genuine breach was to put the station at risk, the crew would be directed to move to their Soyuz spacecraft, and use them as lifeboats to return to Earth. Put yourself in the boots of an astronaut. You may think that upon touching down on Earth in your trusty Soyuz chariot, the danger has passed and you have bested the challenging environment of low Earth Orbit, emerging triumphant. Wrong. The fact is that scientists are far from fully understanding the long-term effects that microgravity has on the human body, but we are aware of more than a few unpleasant side effects of life in microgravity. Indeed, an ISS crew member could lose on average one to two percent of their bone mass per month spent on the station, and upon returning to Earth, stand a greater risk of suffering from osteoporosis-related fractures. Wu is studying the effects of microgravity on cardiovascular physiology and pathophysiology, by examining cell samples that have been exposed to low Earth orbit and returned to Earth. In orbit, the heart doesn’t need to work as hard to circulate blood around the body. This causes it to atrophy, like any underused muscle, and take on a more spherical shape as it loses muscle volume. There are other ways that microgravity wreaks havoc with on astronaut’s body, not limited to bone and muscular degeneration. Bodily fluids behave differently in a low gravity environment, and this can cause an array of problems, including deformation to the back of a spacefarer’s eye, which can lead to some pretty nasty blurring of vision. And a 2017 NASA-funded study suggests that the long term effects of space travel could be more damaging still. Transplanting human stem cells into mice, a team of scientists from the Wake Forest Institute for Regenerative Medicine simulated exposure to the levels of deep space radiation the equivalent to a three year, 140 million mile round trip to Mars. Worryingly, the researchers found that, not only might the trip severely weaken an astronaut’s immune system, but the genetic damage could also significantly increase the risk of developing leukaemia. So, while you might fulfil your life’s ambition of becoming an astronaut, there could be some pretty fatal side effects. These are just a few examples of how life outside of Earth’s atmosphere is a risky business. A side effect of the incredible engineering talent that has made humanity’s presence in space possible is that it can, on first glance, appear relatively safe. But the reality is that death is only a single misfortune away.